Spring always makes sure that love is in the air and it always evident once the wedding invites start to roll in. For spring events and weddings I love to start taping into some of the beautiful, vibrant colors and bold prints that help shake off the winter for me. While in Milan I fell in love with the Pinko brand and decided to give my print maxi a spin for my first Spring wedding of the season. I feel somewhere in some style book I never read or would ever follow there is something about how mixing bold prints and colors is a no no. However, as style should be an extension of our personalities I agree to disagree. 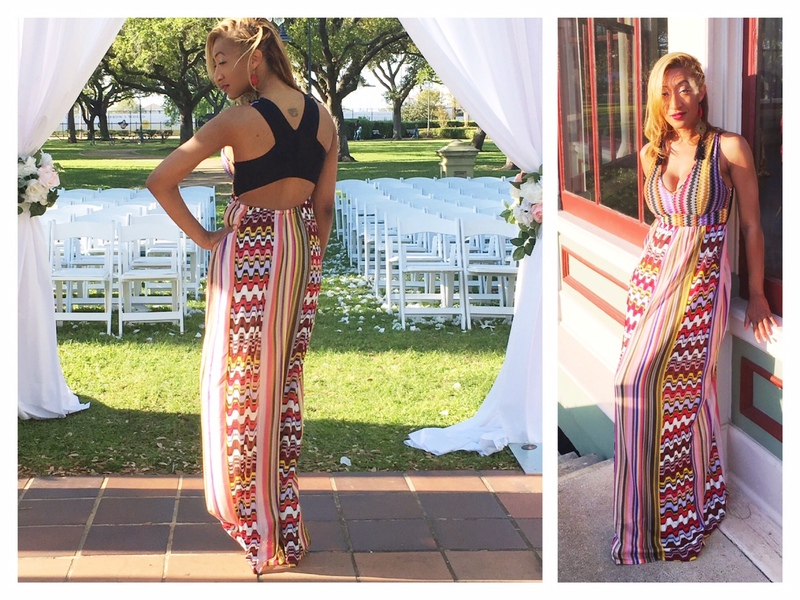 This Long Dress in Raschel Pinko dress delivered a mix of things I absolutely love: the comfort and ease of a maxi, the fit of knits, and bold colors that ensure you leaving a lasting impression. The dress also took some fun liberties like this wide strapped back closure. The black fit offered a break from the colorful pattern while still managing to keep the dress flirty and fun. The empire waist of the dress worked to flatter almost any figure as you can accentuate your best parts while keeping the curves to a minimum at someone else’s special day. By transitioning the top print from the rest of the dress you keep the eye busy and the vibe cool with a blend of luxury design blended with a vivacious color palette. At this romantic ceremony this Pinko dress gave me the ability to enjoy the celebration from outside ceremony to end of night party with style and effortlessness!